Can women’s soccer catch up to men’s this year? 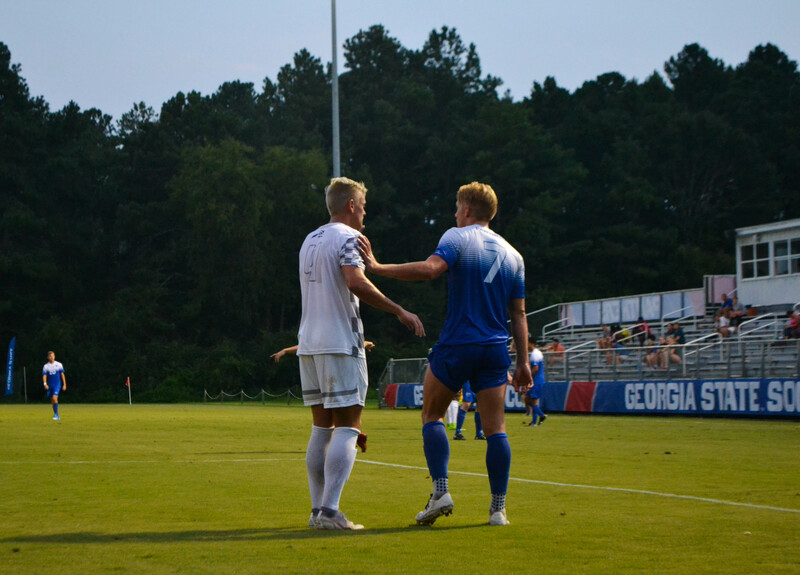 The soccer programs at Georgia State have drifted in opposite directions over the past few seasons. The men have been very successful, playing in three straight Sun Belt Conference Championship title matches. And on the other end of the spectrum, the women’s team has struggled immensely, winning just eight games over the last two seasons. Even with such polar opposite performance between the two teams, women’s soccer head coach Ed Joyce is confident his team can rebound this season. The men’s team will have one of the best teams in the Sun Belt this season, capping off last season with a record of 12-7-1. They return 15 players from the 2017 team, including seven starters. Although they lost Rashid Alarape, who was the team’s top goal scorer, and Yannic Horn to graduation, the Panthers bring back four All-Sun Belt Conference performers from a year ago. Kyle Clinton, Liam Fitzsimmons, Max Hemmings and Hanes Burmeister each received all-conference recognition at the end of last season. All four except Fitzsimmons were in the team’s top five for goals scored last season. Clinton was named the 2017 Sun Belt Defensive Player of the Year. He, along with Burmeister and Hemmings, was named to the 2018 preseason all-conference team. This team is very capable of reaching any goals they set out to accomplish this season. The 11 new players who entered the program this year have impressed Surrency and added to the overall strength of the team. The Panthers kick off their season with two games on the road against Central Arkansas and Louisville. Georgia State looks to take down Louisville after a close 1-0 loss last season to the No. 11-ranked team. Also on the non-conference schedule are matchups against South Carolina and Mercer. The Panthers kick off Sun Belt play at Appalachian State on Oct. 6. There’s no doubt this team is deep and talented, but time will tell whether or not they can finish at the end of the season and send the seniors out on top. The women’s team is coming off a very rough 2017 season. The team’s overall record last year was 3-11-3. And despite such a down season, the women’s program seems to be teeming with optimism. Georgia State returns seven starters from last year’s team, including Monique Hundley, the lone Panther selected to the preseason all-conference team. The 15-freshman 2018 class is the first that Joyce and his staff recruited, and they are excited about the potential of the young players. In addition to the returning players and freshmen, the Panthers added five transfers to the mix, two of which come from Power 5 programs in Georgia and Tennessee. Those two players are Hannah Davis and Lexi Knox, respectively. Also joining is goalkeeper Madi Card, a graduate transfer from Butler. In 2015, Card set both Butler’s single-season record with nine shutouts and 1,968 minutes played. Although Joyce did not recruit much of the roster, he was able to get the recruits to buy into his coaching style, and that will be key to the team’s success this season. Along with Hundley, there are six returning starters: Alex Addington, Lily Barron, Isabelle Grest, Caitlin Ray, Mikella Rodriguez and Brooke Shank. The team had several exhibition matches before the season started, giving Joyce some indication of what the team’s identity will be this season. And according to Joyce, he was pleased with what he saw. Georgia State (0-2) fell on opening day to Tennessee Tech despite shooting more two more shots on goal. The Panthers will have two more games against in-state competition this year after losing 1-0 to Kennesaw State on Aug. 19. They host Mercer on Aug. 24 and play Georgia in Athens on Sept. 7. The Sun Belt portion of the schedule kicks off with a matchup against archrival Georgia Southern on Sept. 14. “Non-conference slate for us is about developing an identity within the group, finding what we’re good at and what things we need to get better at and then roll into conference play ready to go,” Joyce said.